The compendium is made of three main leaves with additional hinged plates. 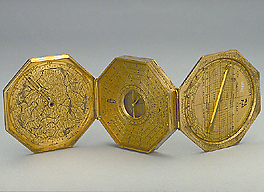 The outer side of the upper leaf of this octagonal compendium is engraved with a polar projection of the northern hemisphere to the Tropic of Capricorn, on a rotating circular plate. The plate is engraved with a scale of degrees, divided by ten and by two, numbered from 10 to 360 by 10. The 0? of longitude is West of Africa. There is a small knob for rotation. Surrounding the plate is a scale of hours, divided to the quarter hour, numbered 1 to 12 twice. This scale could serve as a pin gnomon dial if a gnomon is put in the central hole. Two cardinal points are named '? SEPTE ?' and '? MERIDI ?'. On top of the map is a zodiacal ring, with counterchanged equator and meridian. The zodiac ring is engraved with a scale of degrees, divided to ten, subdivided to two, numbered from 10 to 30 by 10. The names of the zodiacal signs are engraved in full. A brass arm fixed at the centre of the plate is engraved with an unequal scale of latitudes divided by ten, subdivided by 2 from  to 20 towards the outside and from  to 40 towards the centre, numbered from 20 to 70 by ten. The inside of this leaf has a south oriented map of central Europe centred north of Nuremberg, surrounded by a scale of hours, divided to the quarter hour and numbered 1 to 12 twice, with the main 12 compass points named in German. A small pointer slides on a cursor centred in the centre of the plate. The inside of the central leaf has a compass in the centre, marked with ' ? SE ? ', '? OR ? ', '? ME ?' and '? OC ?'. The compass needle is detached. A pointer, fixed at the centre of the compass by means of a cross piece, moves on an hour scale divided to the quarter hour, with dots for the half hour, numbered 1 to 12 twice. Around the compass is a gnomon dial with folding solid gnomon (now missing) with common hours divided to 1/2 and 1/4 marked by dots and lines, numbered from 4 to 12 to 8. The dial can be used at latitudes 45?, 48?, 51? and 54?, is inscribed at the bottom '? HOROLOGIVM ? HORIZONTALE AD ? ELEVATI::ONES ? POLI ? ? 45 ? 48 ? 51 ? 54', and the latitudes are repeated on the two sides of the inscription. The back of the central plate is inscribed with a list of cities and latitudes, reading from the outer band: 'AVGSPVRG 48', 'STRASBVRG 48', 'S:WEISENBVR: 46', 'BRAND:<E>BVRG 52', 'MEIDENBVRG 52', 'SALCZBVRG 47', 'REGENSPVRG 48'. The second band has 'NIERNBERG 49', 'MARTPVRG 51', 'HEIDELPERG 50', 'HAMBVRG 55', 'WITENBERG 52', 'FREIBVRG 48', 'LEBENBERG 54'. The third and fourth bands, except for the first and last city of each, are engraved on a further brass band, fixed to the plate by means of two rose-shaped rivets. The third is engraved 'DRESDEN 51', 'SCH<WEI?>Z 46', 'ROTWELL 47', 'COSNICZ 47', 'SPEIR 49', 'LIND<AV?> 46', 'ZWICKA 51'. The fourth band is 'KREMS 47', 'KOL<?>G 50', 'POSNA 54', 'ARNSTAI: 51', 'LEIBZIG 51', 'ROS<TOC?>K 55', 'GORICZ 51'. The fifth ring is 'ERFORT 51', 'CASSEL 51', 'TRIER 50', 'BADEN 48', 'WORMS 49', 'EGER 50'. The sixth and last ring is 'VLM 48', 'VILACH 45', 'WIEN 47', 'STEIR 47', 'ZIRCH 46', 'C?LN 51', 'PRAG 50'. In the centre of the plate is the back of the compass box, which is engraved with a bust of a woman. Between the hinge and the compass case is an engraved circle devoid of markings. The inside of the lower leaf, hinged opposite the upper leaf, has a lunar volvelle. The rotating part of the volvelle is pierced to show the lunar phases both visually and in figures, numbered from 1 to 29, and is engraved with an aspectarium. Two sets of hours are engraved along the edge, divided to the quarter hour and numbered from 1 to 24 the inner one and from 1 to 12 twice the outer one. A knob for rotation is fixed between the two circles of hours. Two diametrical indexes correspond to the markings on the underlying plate. This is engraved with a scale of hours, divided to the half hour and numbered 1 to 12 twice, then with 'HORTVS HORE' and 'OCCASVS HORE', with hours divided in eight parts each, numbered II to X twice. The third ring from the centre is engraved only with '? SOLIS ?' twice, and the fourth and last ring is engraved with 'DIES ? QVANTITAS' and 'NOCTIS QVANTITAS', numbered from 4 to 20 twice. A further circular ring is soldered on top of it and is inscribed 'EXTERIOR LVCIS SPATIVM TIBI DENOTAT ORBIS INTERIOR SVRGAT RVTILANS SOL QVANDO CADATVE [three dots]'. The outside of the lower leaf is engraved with a Rojas projection with hours numbered from 1 to 11, and the names of the zodiacal signs engraved in Latin, in a circular recess inscribed in the octagon. A diametrical rule is inscribed 'REGVLA ? ORTVS ? ET ? OCCASVS ? SOLIS ? ? ?'. Above and below the projection are the inscriptions 'HORE ? ORTVS ? SOLIS ? ?' and 'HORE ? OCCASVS ? SOLIS ? ?'. On the lower side is '? NOCTVRNALE ? VERSVS ? ? ? POLVM ? ? ARTICVM ? VEL ? ? VRSAM ? MAIOREM ? APLECANDVM'. The outermost ring on the circular recess is engraved on the top quarter with a quadrant of degrees, divided to two and to one degree, numbered from 10 to 90 by 10, and inscribed on an inner circle 'ELEVATIONES POLI ? ? ?'. The top right part of the circle is inscribed '? HORE ? STELE ? MAIOR:'. The lower side of the circle is a nocturnal with hinge at 21 August. The calendar scale, engraved on the space between the circle and the octagon, is divided by ten, by two and by one day, numbered by ten from 10 to 30 or 31 or 28 as appropriate. The names of the months are inscribed in Latin. The nocturnal index is missing. The lower leaf is kept closed when not in use by means of a catch. On the sides of the main box of the compendium is the inscription '? D : IOANNES ? ? ROSENBERGERVS ? HOC ? INSTRVMENTV<M> SIBI SVISQVE ? IN PERPETVAM ? ? SVI ? MEMORIAM ? ? FIERI ? FECIT ? ANNO 1557' and below the date, in smaller script, 'ET CHRISTOPHORVS SCHISSLER FECIT'. The instrument was presented by Maurice Rosenheim in 1913 and is described in F.A.B. Ward, A Catalogue of European Scientific Instruments in the Department of Medieval and Later Antiquities of the British Museum (London, 1981), p. 121, no. 349.